The Wall Street Journal for April 27 2017 had some startling news related to Neanderthals and North America! In my Arken series I decided to place Neanderthals in America only 13,000 years ago, even though there has been no fossil evidence of Neanderthals like there is in Europe and Asia. However, as reported yesterday, an excavation for freeway construction in San Diego unearthed mastodon bones and some of them had been crushed using a stone tool. This is done in order to eat the marrow, not the best of meals but better than starving. Archeologists unearthed a stone near the bones which appears to have been used to smash the bones, (the surface patterns match the bone damage), meaning this was a stone tool used by humans to get to the marrow. The bones have been carbon dated to be 130,000 years old which is far earlier in the history of this continent than existing migration theory which places mankind coming to America only 13,000 years ago. Steven Holen, director of research at the Center for American Paleolithic Research in S. Dakota, who led the international research team stated that they have made a very good case for the 130,000 year ago date for humans in California. And researchers added that because this earlier date is so far back in time, there is a possibility that Neanderthals were the ones using the stones to break the mastodon bones, indicating that it was possible Neanderthals had actually lived in N. America long ago. I was startled by this report because when I started writing my books about 15 years ago, no one thought Neanderthals could have lived in America. 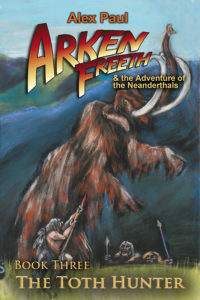 I thought that it might be possible and used the fact that my books are fiction to add Neanderthals into the story mix because they created a far more interesting world for Arken’s adventures to take place. I also said at the beginning that Neanderthals interbred with humans, and at the time scientists were saying this was not true. But now of course DNA testing has proven that us humans, Cro Magnons, did indeed interbreed with Neanderthals. So this is one of those classic cases where fiction predicts fact when science catches up to the fictional world!